Based on reviews from 607,368 users. 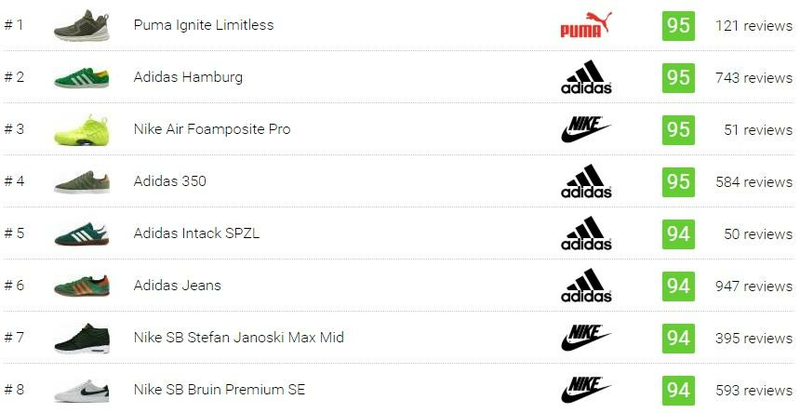 Learn how our rankings work or see our guide to green sneakers. Updated Apr 2019. Considering that you've decided to narrow down your sneaker search by filtering through our colorway options, you may already have an idea about the importance of a shoe's colors. Whether you consider your kick's pigments to be an extension of your personality or a way to enhance your look effortlessly, a pair's hues can also make or break your outfit and, more generally, affect its popularity in the sneaker scene. The color green means many things, but most people are initially put off or intimidated by the thought of rocking a pair of green sneakers. Maybe because pairing it with an ensemble might appear daunting at first or they think of green as downright ostentatious, not knowledgeable of its various shades that exude different characters and vibes. Here we laid out in-depth information all about green sneakers – its shades, meanings, examples, and how to style – to introduce you to the versatile and underrated color that is green. Pantone has announced green as the color of the year in the past, yet some people don't dare to wear it or even consider it. But when you think about it aside from the usual neutral colors and blue and red, green is one of the most popular colors of all time. This fact has been proven through numerous surveys that show green has been consistently included in the top 3 of the world's favorite colors. Green is generally associated with nature, growth, renewal, health, and life but it has such a broad spectrum of colors that they evoke different meanings and emotions, positive and negative alike. As a brief overview, we've picked out nine most well-known shades of green, their meanings, and a few shoe examples that fall under each shade. Usually seen on young or newly grown plants, it indicates renewal, youthfulness, and environmentalism. It promotes viewing things from a new perspective and fresh starts. 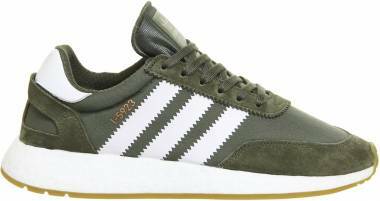 Some Pale green sneaker examples are Adidas Gazelle Decon in Trace Green and Adidas Campus Vulc Mid in Pale Green and Black. This type of green seems to be associated with negative connotations as it is reported to suggest sickness, cowardice, discord, and jealousy. Despite these interpretations, this color is typically used in sneakers to add a pop of color. Some of the shoes that fall in this color category are the OG Instapump Fury in Solar Yellow/Green and Gucci Coda Neon Leather in Green. It is a bright green hue that resembles that of the skin of the citrus fruit with the same name. It inspires liveliness, playfulness, creativity, and high energy. It is also said that it helps clear the mind of negativity. The Converse Chuck Taylor All Star Low Top Neon and the Vans SK8 Hi in Neon Green Mono are some the sneakers that display this color. This color can signify health and abundance. It is also the color of money. 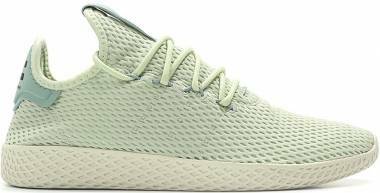 Some examples of grass green sneakers are Vans Old Skool in Ultramarine Green/True White and Adidas Iniki Runner in Green. It is a greenish-blue color and is said to calm the spirit, offering emotional healing and protection. It is recommended as the best color for rest and relaxation. Adidas Cloudfoam Advantage Clean in Clear Aqua and Nike SB Zoom Stefan Janoski in Noise Aqua are the shoes with the same hue. A bright green color that is derived from that of a precious gemstone with the same name. It is an uplifting color that indicates abundance and wealth in every form, from creative ideas to material and emotional wellbeing. 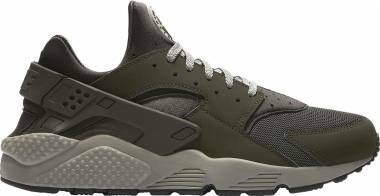 Look up Nike Air Huarache PRM in White/Emerald Green and Adidas x Alexander Wang AW Skate Green for variations of this type of green sneakers. This color is associated with trust, diplomacy and spiritual generosity as it is said to increase worldly wisdom and assists in the journey towards enlightenment. Converse One Star Pinstripe Ox in Mint Green/Jade Lime/White and NB 574 in Jade Green/Fluorescent Green are some kicks in this color. It is a deep yellowish-green and is the traditional color for peace, although ironically it is also associated with soldiers. This color also suggests deceit and treachery. This color provides a more mature look to the shoe. 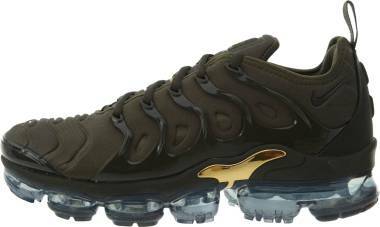 Look up the Bow sneaker from Puma in Olive Green and Nike Air Presto Ultra Breathe in Olive Green as examples. There is a degree of resentment in this color as it is often used by wealthy businessmen and usually signifies greed and selfishness. 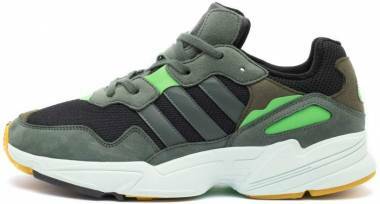 But dark green sneakers are often associated with luxury and sophistication. New Balance 840 in Forest Green and Nike Air Pegasus 83 in Forest Green are some of the sneakers with dark green hues. 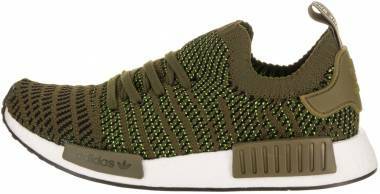 Green in all tones had been used in sneakers in many ways: some went all the way with a tonal green sneaker, others combined it with other colors while a few used it as stylish accents to elevate plain-looking sneakers. Here are some outstanding sneakers that somehow incorporated green in their design. Considered to be the brand's most iconic pair today, the best-selling Stan Smith is widely known for its minimalist white colorway with grass green accents on the tongue and heel counter. It is Adidas' first tennis shoe and was originally called the Haillet but changed to Stan Smith in 1971 due to Haillet's retirement. Thanks to its simplicity and distinct colorway, this shoe now stands on a legendary platform along with a select few sneakers. 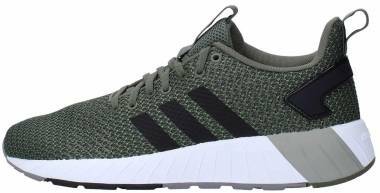 This shoe boasts a Japanese-inspired design that makes use of the brand's Primeknit and Boost technologies. It is the sibling of the NMD_CS1 Primeknit. This pair's stylishly progressive design combined with the NMD line’s sought-after comfort makes the City Sock 2 Primeknit from Adidas one of the most popular shoes today. A Trace Green/Trace Pink colorway is offered in a women's iteration that exudes a balance between bold and subtle. The timeless Hamburg design has withstood the fast-paced trends of today's sneaker scene. Since its release in 1982, it is still considered stylish today amidst technology-driven pairs. Back in the 80s, this shoe was released as part of the "City Series," and became a favorite amongst football casuals and mods. Today a new generation of retro-loving sneakerheads can choose from a wide array of colorways that include a tonal dark green upper, a Green/Yellow number, and a Vapour Green/Ice Mint color to add oomph to their look. Initially released as a Japan exclusive in the 80s, this kick was reissued by the brand's SPEZIAL range and is now available under the Originals line. Its no-nonsense design was its gateway to the consumers' radar then and will capture today's sneaker fans in the same way. Try it in the Ash Green/White/Gum and Green Nubuck colorways for a stylish pair of green shoes. Taking inspiration from the 70's and 80's Freizeit collection, this kick displays a retro design with a timeless style. It is crafted from suede upper and available in two colors: green and black. It is meant for vintage sneaker fans who like it old-school and classic. Initially created for the hardwood courts, it didn't take long for this pair to win over the streets. 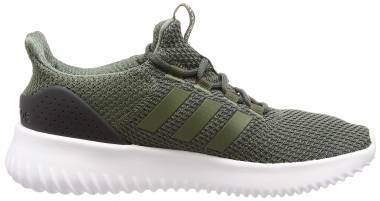 Thanks to its unconventional Tubular Shadow silhouette and superb comfort sneaker fans instantly favored this kick. Everybody knows about the Yeezy line thanks to its famous and controversial co-designer, Kanye West. The Yeezy 350 Boost v2 has a bigger boost sole compared to its predecessor. 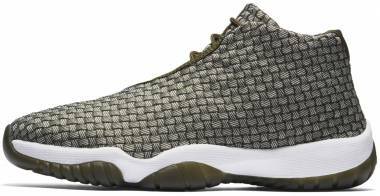 It is available in at least three colorways including a Dark Green iteration. Initially released in 1997 along with a Pro version, the Air Foamposite One is the very first kick to feature a synthetic one-piece upper. Its unique silhouette garnered mixed reviews, but some fans couldn't pass up on stylish colorways such as the Legion Green and Dark Army. Initially introduced as a basketball shoe, the Bruin was adapted and re-engineered for skateboarding. Skaters and sneaker fans replenished their love for the kick in 1985 when it made a cameo in the movie Back to the Future. The main character Marty McFly was spotted skating in this kick in the film. Formerly a running sneaker, the Duel Racer along with its sibling the Air Mariah introduced the minimalistic approach to running. It geared away from traditional heavy materials during that time. Check it out in the Menta Green colorway for a pop of color to your ensemble. The first sneaker to feature the brand’s now famous visible Air unit had a Flyknit makeover. It now comes in a lighter and more breathable upper to keep up with today’s modern kick. If you’re a fan of the OG then trying this kick in the colorways Cargo Khaki, Voltage Green, and Volt. This latest addition to the Air Max family is inspired by two of its predecessors: the Air Max 180 and Air Max 93. The 270 from the Swoosh boasts of the brand's biggest heel Air unit thus far. Moreover, its colorways that utilize color blocking are deemed to be stylish by most consumers. Try it in the Olive or Neon Green colorways for a pop of stylish accent to your ensemble. This pair's pristine white upper accented with a green and red Web detailing became a recognizable and iconic silhouette to sneaker fans. 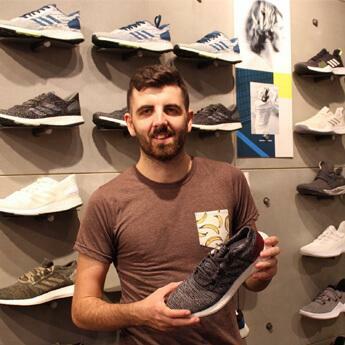 It has been imitated by retail fashion brands and provided a great alternative to the Stan Smith. Famously worn by the Star Boy singer, the Weeknd, the Puma Ignite Limitless was launched in 2017 as part of the "Run the Streets" project. Its unique silhouette is backed up by technologies that provide comfort and durability. These are the same reasons why consumers adore it. Puma designers, spearheaded by Heiko Desens, introduced this shoe in 2017 with the aim to pave the way for the future of the brand's sneakers. Tsugi means "next," and Shinsei means "rebirth," which is an apt name for its reported purpose. Its upper is crafted from the brand's EvoKNIT and mesh technology offering a minimal, breathable and lightweight fit. Initially called the Newport Classic, this kick was released in the 80s when tennis shoes were trendy. Its timeless style and minimal silhouette remain relevant today. Try it in the Hunter Green colorway with gum sole to keep your sneaker rotation interesting. Introduced in 1981, this pair was manufactured with the ambition of producing the finest running kick in the world. It won "best quality" and helped catapult the brand's relevance during the 80s. This kick utilized the Jazz's design as its starting point and added a plush EVA midsole for enhanced cushioning while a TPU piece was placed in the heel for stability and support. It resulted in a bulkier yet minimal silhouette. It is available in a number of green shades to complement your different moods. A few years after introducing the Shadow Original, this kick was released. It featured upgrades for enhanced performance, which includes a reconstructed EVA midsole for better shock absorption and support, and more overlays in the upper for better stability. Considered to be one of the brand's most iconic releases, the Gel Lyte V's retro running silhouette combined with its superb comfort are some of the reasons why it is still loved by sneakerheads today. Their wide arrays of colorways provide consumers with endless options for switching up their look. Check it out in Agave Green and Hampton Green to keep you looking styling no matter the season. Another running silhouette from the brand, this shoe was released in 1990 and remains as one of the primary choices in the brand's lifestyle section today. It offers a great alternative and a more straightforward design than the Gel Lyte III's split tongue. Formerly called the Style #44, this shoe is the brand's first ever model release. Initially manufactured as a lifestyle shoe, a skateboarding clientele started to grow due to its grippy outsole. Its straightforward design remains relevant today and comes bathed in a multitude of colorway options. Inspired by previous releases, the Chukka Low was designed by the brand's skate team in 2006. Its upper's design took after the Chukka Boot while its low-top profile and sole design came from the Authentic. Its Green/Gum colorway offers a fun switch up to traditional colorways. Brands tap on big names in the industry to market and deliver their merchandise to the customers. Through collaborations, sneakers quickly become the hottest commodity in the market. No matter how subtle the updates are the right partnerships will still have an impact throughout the sneaker scene. Here are a few collaborative green shoes that made a wave in the industry. The classic Stan Smith received an all-new look through this collaboration. Its leather upper was replaced with a modern one-piece mesh material and also ditched the traditional eyelets for a more modern lacing system. With a budget-friendly price, comfort, and unique design, this pair has gained a loyal following. The NMD_R1 alone is a very sought after shoe, so when combined with the famous Japanese streetwear brand BAPE it makes for the perfect recipe to create demand and clamor amongst sneakerheads. It instantly sold out as soon as it released. Lastly, its camo design could work great as the finishing piece to your ensemble. There's no denying coffee's influence on people, and this collaboration is a manifestation of that. This collaborative sneaker is designed with Starbucks as its partner. The kick displays a coffee brown color with swirl patterns throughout, while green lining and accents display the coffee giant's signature color. Streetwear giant, Supreme, is known for picking out the most unlikely sneakers from the past to put their twist on. 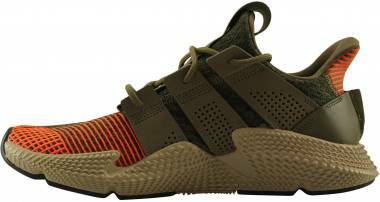 Although not as hyped as their other sneaker collaborations, this release still garnered a lot of attention and introduced the Air Humara to a new generation of sneaker and streetwear enthusiasts. Nike celebrated their relationship with skate and hip-hop when they released the SB Dunk Hi and Low in 2005. Skaters and hip-hop fans rejoiced as it became a symbol for their love of freedom of expression, creativity, and, of course, the De La Soul rap group. This shoe boasts of the group's signature colorful designs with hints of green throughout. This collaboration is the third colorway in a series that commemorates Undefeated's 15th year in the industry. The classic "silver bullet" kick received a fresh treatment with a tonal Olive Green upper with hits of orange. Few things stand the style test of time better than the Camo. Released in 2014, this collaboration between industry giants further strengthens the statement above. This kick quickly sold out as soon as it released and is now reselling at an average of 30% higher than its retail price. A long time Asics collaborator, BAIT aimed to combined the common and uncommon elements through this release. The kick is the first of three shoe models in the "Basics Program." It exhibits a stylish green sneaker colorway with pops of red, black and white. This colorway was inspired by the green of coca plants and looks back at the drug-fuelled past of their new pop-up shop's location in Miami. It boasts of a lime green color that could elevate any ensemble in a snap. Created to meet the demands of consumers who didn't get to cop from a previously limited release, this kick was met with fervor and sold out almost instantaneously. Its gray upper with green accents lend a touch of calming vibe to the fierce Skytop III. The two brands have had a long history when it comes to collaborating. This particular partnership is inspired by money hence the rich green sneaker colorway with hits of white and gold accents. It retailed for $180 and debuted on October 15, 2016. Released in the summer of 2017, this kick is a collaboration between the sneaker brand's eclectic collection called the Vault and the artist collective called Brain Dead. The three shoe models in this collection use bold colors and strong graphics inspired by the spirit of subculture. The One Star has a rich background that dates back in the 70s but didn't really experience success until the 90s. The kick gained a cult following during the DIY era of the 90s when it became known as an anti-establishment kick. And with today's resurgence of 90s trends, this collaboration with Tyler, the Creator is aptly timed. This collaboration also offers unprecedented pastel sneaker colorways. This pair boasts of a color-blocked design that is dipped in glitter. It is inspired by the disharmony between convention and disruption, which is represented by the runway and the streets respectively. How to style green sneakers? Which outfits go well with it? Green sneakers can be versatile and if you're not sure how to dress them here are some tips you can try. This type of green is bright and eye-catching. It adds a sporty flair to your outfit and an excellent choice if you want to add a pop of color to your look. This color is usually worn to make an ensemble more interesting. It is best paired with subdued or neutral colored outfits for a balanced look. All pastel colors are light-colored, soft and muted. It is usually described as "nearly neutral" and "pale." If you're going to take the tried and tested route go for a neutral outfit, but if you want to stand out opt for a pastel-themed outfit. A mint green top and beige trousers scream spring from head to toe. Complement your true green shoes by accessorizing your neutral ensemble with a scarf, a hat, a bag or a jacket in the same green hue as your kicks. And if you're feeling a bit more adventurous, then you can opt for a printed top or dress in neutral colors. The darker you go, the more formal and neutral the green looks. 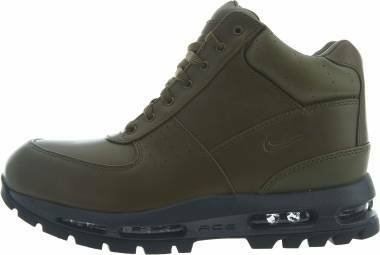 If you opted for an Olive green pair or Forest green sneakers, then you can most likely pair it with any color, and can easily dress it up for formal occasions too! How to keep my brand new green shoes in its pristine condition? With limited releases, innovative technologies, and superb comfort, sneakers are considered an investment nowadays. If you've paid for something, you'd naturally want to make it last as long as possible to get your money's worth. Here are some steps you can take to prolong your kicks' life. Spray your newly purchased green shoes with waterproof and/or material protector. It will shield your pair from the elements helping it gain longevity for the long run. Give your shoes a breather by alternating with other pairs. Also, let it air dry for several hours before storing in an enclosed container. Always wear socks to protect your pair from moisture and perspiration, which causes the insoles to deteriorate. Make it a habit to clean the insides of your shoes especially if there is an odor problem. You can swab the insides with alcohol or a drop of tea tree oil as antifungal agents. Make sure to avoid the outer part in order not to stain it. To help retain your pair’s original shape investing in a shoe tree is important. Where can I buy green shoe dye/polish? First, let's address why these products are a necessity if you want to make your footwear last. To put it simply shoe polishes are needed to keep your leather nice and supple while shoe dyes can help restore your shoe's faded color. Now that's clear let us help you sort out the problem at hand. Green shoe polishes in varying shades are readily available in specialty leather stores and Amazon. For shoe dyes, you can try the brand Angelus as they carry a wide array of color selections. Angelus can be found in Walmart, Michaels, and Amazon. Some people have viewed things with the color green as unlucky, and this superstition goes way back in history. Sources say it originated in various medieval European societies that connote the color green with evil and the spiritual world. This belief comes with several instances that believers say are proofs to the color's unluckiness. But just like any other superstitions out there, the evidence they present doesn't show direct connections between being unlucky and the color green. Hence, it is only real if you believe it. I frequently see athletes sport a pair of neon green kicks. What are they and where can I buy them? Athletes mostly use neon sneakers as a fashion statement while brands use it for marketing. This question somehow validates the efforts of the brands and athletes as it has captured your interest. 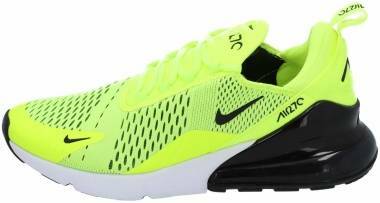 The most popular neon green sneaker colorway that you always see on athletes is Nike’s “Volt.” Its striking and attention seeking color is considered as one, if not the most, notable colorways of all time so far. 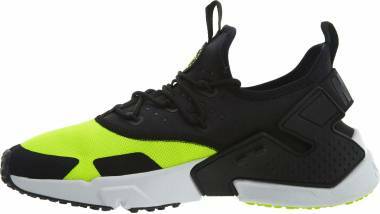 First used in performance shoes, the Volt colorway has made its way through the lifestyle category. Check out the following Nike kicks that feature the famous neon green sneaker colorway called Volt. Which green shoes made an appearance on the big screen? Nike Air Max 2012 in Black/Fluorescent Green - Worn by Kevin Hart who plays Ben Barber in the movie Ride Along. Adidas Ultra Boost in Green/Red – Renton gives Spud these sneakers in the T2 Trainspotting movie. Adidas Samba SPZL in Solar Slime – Worn by Ewan McGregor in T2 Trainspotting movie. He plays the character, Renton.